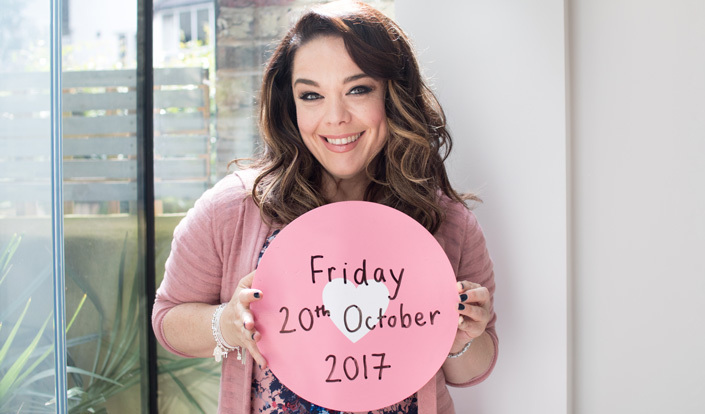 We are excited to announce that actress and TV presenter, Lisa Riley, will be joining us again this year to support wear it pink. We talk to Lisa about her personal connection to the breast cancer, why Breast Cancer Now’s life-saving research is so important and why everyone should get involved in wear it pink on Friday 20 October. Breast Cancer Now is a charity very close to my heart, as I lost my beloved mum, Cath, to this awful disease. We were able to spend 11 more years with her after they found the first tumour, but unfortunately it came back in her pancreas and she lost the battle in 2012. When I was first told that mum had breast cancer I was just devastated, because you instantly think the worst. Nowadays it’s not always the case and people’s lives are being saved by the research out there. We need to talk about that more. What motivated you to support Breast Cancer Now? Losing my mum to this terrible disease made me determined to get the word out there and spread awareness. We have to be aware of our bodies and we can’t be frightened of being breast aware. That’s simply knowing what your breasts look and feel like normally, looking out for any unusual changes and getting them checked out by your doctor, because the sooner you check, the sooner you might notice something. I want to put out there how important it is to talk about self-checking without it being a taboo. It should be something we speak about with our girlfriends and female relatives on a regular basis. Don’t worry about being dramatic if you find something unusual or that you’re worried about – go and see your doctor because that’s what could save your life. For women who have been diagnosed with breast cancer I want to say this: find your friends and find your loved ones. We were given shoulders for a reason, really strong shoulders. As women we can stick together and talk about it. If you’re having a bad day, tell your friends and your loved ones because you’re allowed to. What do you love about wear it pink? Wearing pink for Breast Cancer Now is all about having fun and raising money for vital breast cancer research. Use the opportunity to be daft and do silly things. It's your chance to make your family, friends and colleagues look silly for the day and get away with it – that’s why I love it! It’s fantastic to get everyone coming together and raising much needed funds to support breast cancer research. Why do you think it’s so important to wear pink on Friday 20 October? Research into breast cancer is advancing every day because of fundraising days like these – days where we can raise the money and come together. Wearing pink shows that we’re united. We are putting our little pink stamp on the UK and saying that we will raise money for the research that’s so drastically needed. I encourage everyone to get involved!